It wasn’t that long ago that we sucked at bed styling… like really sucked! But having always drooled over the perfectly styled beds in magazines and inspirational Instagram accounts, we decided it was time to improve our bed styling game. How? Well, we studied images of beds we loved, looking at just how many cushions they used, how they were placed on the bed, how they mixed prints or textures, and so on. Now that we’ve done the hard yards, we’re going to share the top bed styling tips and tricks we learnt so you can style your bed like a pro! Like with any styling, it helps to have a plan — what mood or theme do you want to achieve? This will inform your colour palette and ultimately the bedding, cushions and accessories you select. Want to channel summer vibes? You might like to use some of this season’s it colours in orange or aqua. Or would you prefer a soft and romantic palette? Blush pink and soft grey is a winning combo! After a bit of crisp elegance? Can’t go past white on white and Steve Cordony recently shared his tips to nail this look. Whatever you decide, consider mixing textures, prints or embellishments so the bedding isn’t all same-same and flat. We love a bargain as much as the next person but when it comes to bedding, we prefer not to skimp. Few things beat the feeling of getting into a luxy bed after a hard day. Now that you know the direction you want to take the bed styling, find bedding that meets the brief. All the bedding pictured in our Spring look above is from Hunting For George who also sell other premium bedding from the likes of Kip & Co, In Bed, and Milk & Sugar just to name a few. 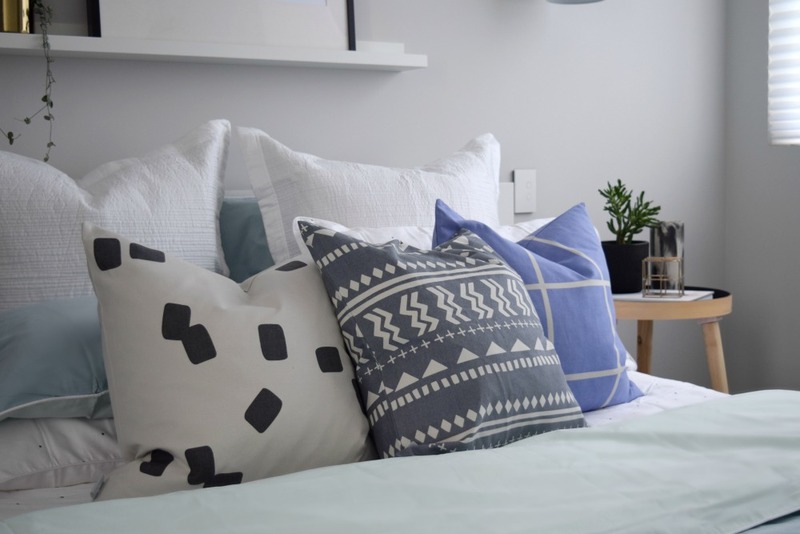 If budget is a concern, consider opting for high quality sheets and more affordable accessories as feature cushions are something you’re likely to change more often and won’t affect a good night’s sleep. How many cushions are too many? Darren Palmer once said he’d never use more than 9 cushions on a bed but since then we have seen him praise some bed styling that used more. For us, 9 is a good number as it allows for 2 x Euro cushions, 4 x standard cushions, and up to 3 x feature cushions. Rather than doing the traditional look of stacking two Euros at the back of the bed, then standing or lying the standard cushions symmetrically and finishing with the feature cushions, we like to mix things up. Check out this short video where we show a different way of placing your cushions for a bit more interest and depth. 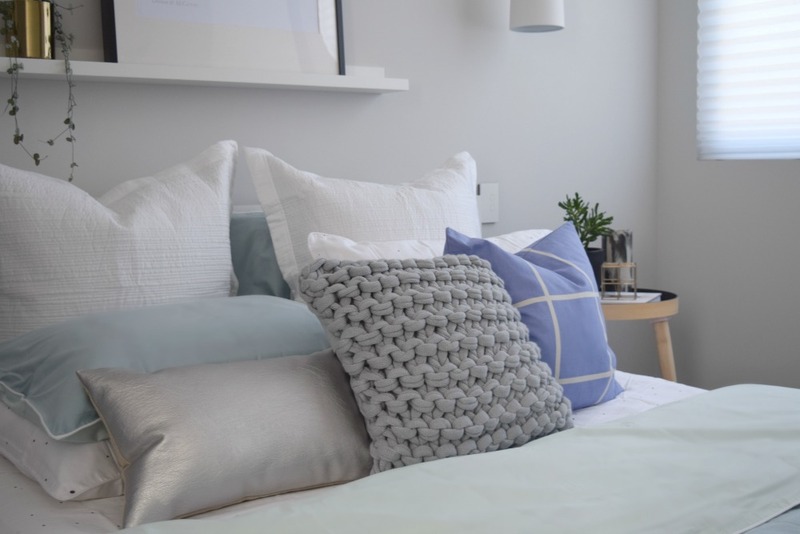 There’s no golden rule or right or wrong number when it comes to cushion styling and it will change depending on how bold or busy your bedding is, the size of your bed and personal preferences of course. We suggest standing back and if it doesn’t look right, edit one thing at a time. You might also need to change your feature cushions so check out the tip below. This is probably the most challenging part of bed styling we had to overcome. What cushions to use to decorate the bed? In our opinion, the best styled beds use a lot of contrast between the feature cushions. Mix shapes: square, rectangle, smarty, knot… there are a lot more shapes readily available now. Mix prints: like we’ve done in our bed look, don’t be afraid to mix spots with stripes or abstract patterns. Mix textures: quilted, velvet, linen, leather… the list goes on. Look for embellishments: small details like a button, exposed zip, piping edge or metallic foiling can add that extra layer of sophistication to your bed styling. There are so many feature cushions on the market and our tip is to go a little crazy! Finish your winning bed look by adding a throw, fur, sheepskin or coverlet to the end of your bed. For an ultra cosy look, you might even like to layer a few. However as we’re heading into the warmer weather and wanted to show a Spring/Summer look, we’ve kept the furs and chunky knits at bay and opted for a light knit in an oatmeal colour. – Look at colour references between the bedding and other things happening in the space — can you pick up colours from an artwork or other decor? All bedding (other than the Euro cases, knitted cushion and metallic cushion) are latest season Hunting For George bedding / Other bedding mentioned from Adairs / Artwork Hunting for George / Side table Kmart (table top has been painted grey) / Cloud vase Zakkia / Brass cube Freedom / Pot plant Have you Met Mrs Jones / Brass planter Kmart. Have these bed styling tips helped you? Or do you have more tips to add? Share them in the comments below! 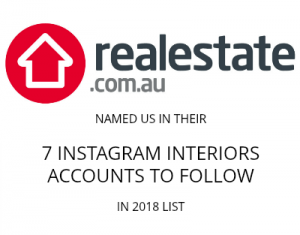 Next articleMelbourne interior shopping tours you won’t want to miss! Might have to recruit all the cushions in our house for this challenge! Love the video tips, Gina. Such a beautiful bedroom look and thanks for the tips. A lot of bed styling can look so overdone and I like the idea of it not having to be symetrical.